New York State Network for Youth Success | New York State Network for Youth Success Mail – Fwd_ New VISTA and Event Updates! 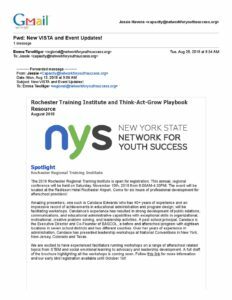 New York State Network for Youth Success Mail – Fwd_ New VISTA and Event Updates! http://networkforyouthsuccess.org/wp-content/uploads/2016/05/nys-logo-color-2.png 0 0 Regional Network VISTA http://networkforyouthsuccess.org/wp-content/uploads/2016/05/nys-logo-color-2.png Regional Network VISTA2018-08-28 12:53:572018-08-28 12:53:57New York State Network for Youth Success Mail - Fwd_ New VISTA and Event Updates!